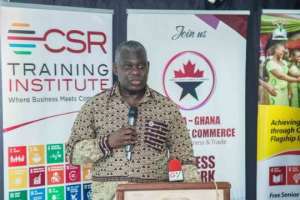 The United Nations Sustainable Development Goals (SDGs) are everybody's business, and business has a central role to play in achieving the goals, Dr Eugene Owusu, SDGs Advisor to President Nana Addo Dankwa Akufo-Addo, has stated. 'I am a firm believer that the SDGs need business and that business needs the SDGs. The SDGs present common grounds for business and government to think together and to act together in finding common solutions to the pressing developmental challenges that confront the world today,' Dr Owusu stated at a seminar on SDGs in Accra. The seminar was organised by the Canada Ghana Chamber of Commerce (CGCC), in collaboration with the Canadian High Commission on the theme: "Why the SDGs Matter for Your Business". The seminar is focusing on; "Why should the SDGs be of interest to the private sector? Should achievement of the SDGs not remain in the domain of governments and international multi-lateral organisations? 'How relevant are the 17 SDGs to the future of our businesses? Do the SDGs perhaps present opportunities that the private sector could pursue for the collective benefit of themselves and our society?" Dr Owusu said: 'The SDGs are powerful inspirations for our world. They are a powerful inspiration for the future that we want - a richer, more peaceful, more stable and a more secured world. They represent a blueprint for a better future for all of mankind'. He said the 17 Goals, which seek to end extreme poverty, fight inequality and injustice, and protect the earth were indeed ambitious, and that it would take unprecedented efforts by all segments of society to achieve them. 'When world leaders agreed on the Global Goals, they were conscious of the fact that the Goals were very ambitious. But history and experience have taught us that once the world puts its collective mind to something, the probability of success is great. 'Ambitious as they are, the SDGs are the boldest and loudest articulation of a collective transformation agenda and development ambition the world has ever seen. We must therefore all put our collective effort together to ensure its success,' he said. Dr Owusu said achieving the SDGs could present significant opportunities for business. He said according to the Business and Sustainability Development Commission Report, achieving just four of the SDGs could generate some $12 trillion in market value adding that these four sectors were Food and Agriculture, Cities (investing in housing, transportation and water), Energy and Health and well-Being. He said it had further been estimated that investing in achieving the four goals would create 380 million jobs and the starting point was that businesses should move to integrate the SDGs into their corporate strategies. 'Just as governments are being urged to align their national development plans with SDGs, businesses must align their corporate goals with the SDGs to maximise coherence and common platforming with the national efforts at attaining the goals. 'Aligning SDGs with business strategies will open up new business opportunities, most likely enhance efficiencies, and spur innovation,' he said. Dr Owusu said with the appointment of President Akufo-Addo, as the co-chair of the UN Secretary Generals Eminent Group of SDGs Advocate; Ghana must demonstrate unparalleled leadership in the implementation of the SDGs. Mr Frederick Attakumah, the President of the CGCC, said the SDGs offered an excellent framework for transforming current global realities to that of a much better world. He said organisations must have a purpose that would enable them to contribute positively towards enhancing the basic humanity and dignity of members of their societies while proactively seeking innovative business models that addressed their current challenges. Ms Heather Anne Cameron, the Canadian High Commissioner to Ghana, said Canada, Ghana and other members of the global community had committed lot of efforts towards accelerating the implementation of the SDGs to eradicate poverty. She said the role of the private sector towards achieving the SDGs was important and lauded businesses in Ghana for their efforts towards the achievement of the SDGs. Ms Cameron said the mutual trade between Canada and Ghana would help create more jobs in both countries. Professor Wayne Dunn, a renowned Canadian CSR Expert, and the President and Founder of CSR Training Institute, who was the guest speaker, in an overview of the significance of the SDGs, said the goals could help businesses to be strategically engaged and be more profitable.